Ohhh, such beautiful sun rays and pretty pink flowers. I’ve never seen a potato plant and never thought of them as having flowers. Very nice photo! This could be a painting!! Morning light is the best. 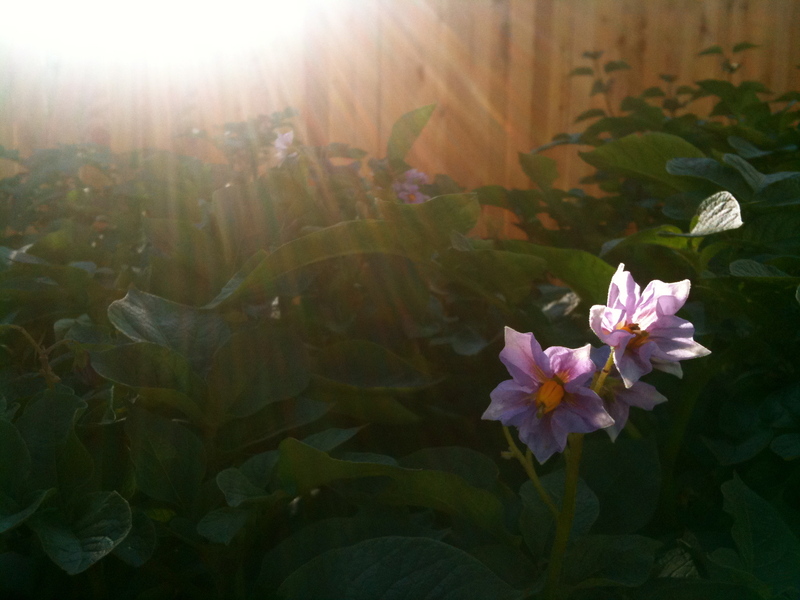 Denise, I didn’t know potatoes flowered, either, but these are very pretty. Lovely picture. Perfect to start my morning. Thanks! Suzanne is right. The pototoe flowers could be a painting. I have a friend who takes wonderful photos of the things he loves and then has them put on canvas and sells them on a website. Maybe you could try it. I love gardens and flowers and herbs and am always looking for art for my walls of such things. Maybe more people than I think so too. Just a thought.